As per the Aadhar Statistics the Manipur population in 2019 is 3,008,546 (3.01 Millions) as compared to last census 2011 is 2,855,794. 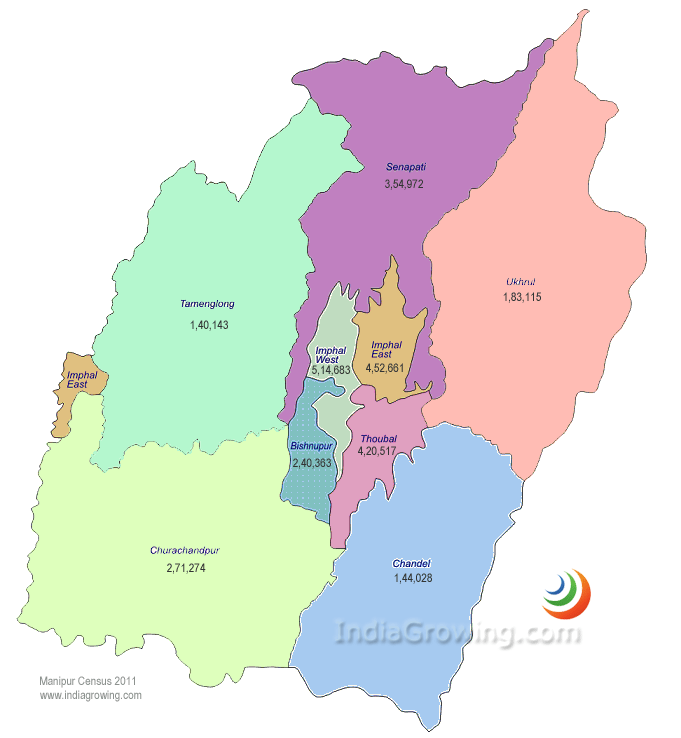 Growth rate of 5.35 percent of population increased from year 2011 in Manipur. till 2018. Manipur is one of the North-Eastern states of India the state comprising of 9 districts, 38 Subdistricts and 2,618 villages. Manipur is bounded by nagaland to the north and mizoram to the soouth and assam to the west and burma to the east. Total area of Manipur is 22,347 sq.kms. Total Population is 27,21,756, out of 13,69,764 are males and 13,51,992 are females. Imphal is the capital of manipur.